Usuki Frenzy and a cute game in which you have to hurry up to collect Usuki Sets before leaving for a vacation. This second version of the game has a few new features that make it more interesting and challenging. In Usuki Frenzy, you control Lucie the Cybunny. Using the arrow keys (up, down, left, right), you must navigate Lucie through the 8 rooms of her house, picking up the Usuki sets displayed at the left of the screen. This is made somewhat easier, as the sets are always in the same room. If a wrong set is picked up (ie, one that is not displayed at the left of the screen), you must place it on one of the shelves. The game has three levels and you have three minutes to complete each of them. In level one, you have to collect four Usuki Sets. This number increases to seven in level two and to ten in level three. If you don't complete a level in the required time, the game ends..
Every time you collect a Usuki Set that is on your list, 15 points are awarded to you. If you collect one of the Usuki Dolls, 16 points are awarded to you. Picking up a wrong set won't affect your scoring directly. For every second that remains of the three minute starting time, 0.5 point is added to your score . For example, if you complete the game with 136 seconds to spare, you will receive 68 points for a Time Bonus. Lucie seems to move faster when traveling diagonally, so pressing two keys in a respective direction can be very beneficial towards your score by increasing your Time Bonus. To help you getting a better score, I suggest you always use the same path when you are searching for the Usuki Sets. As I mentioned earlier, the sets are always placed in the same room. 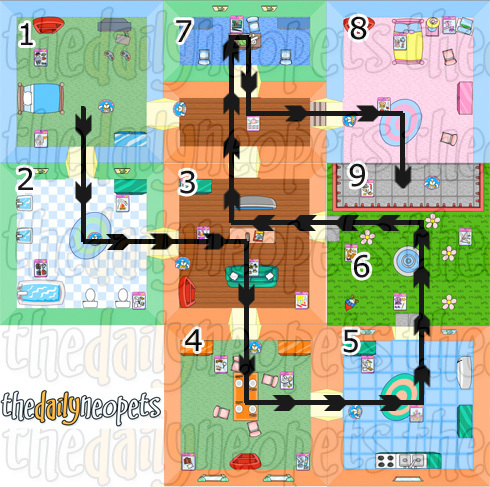 If you memorize where each Usuki set is located, you won't have to travel so much in the neohome to collect the sets. In the following picture, Usuki Sets are sort of like they are in the game. The numbers at the left of the picture match the ones on the previous map. There is a bonus Usuki Doll that you can collect for an extra 16 points, once in the game in the level of your choice. 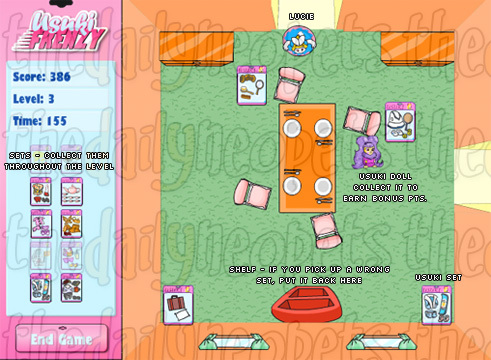 All you have to do is to face the computer in Lucie's room and hit the space bar on your keyboard to make the doll appear in the room as shown in below screenies. If it does not work instantly, you can try to press the up arrow key and it should release the doll. Usuki Frenzy is based on luck, more than actual skill. Your score depends of which Usuki sets you will have to collect during the game and their place in the neohome. Knowing your Usuki Sets, combined with luck, will make the difference between a trophy score or an average low score. Good luck!